For all of you who do December Daily or JYC (Journal Your Christmas) albums, this is the place to talk, share, and get ideas. I am starting this discussion now because I know some people scrap last years photos during this holiday time and many have unfinished albums that need to be finished before more December photos start happening. Don't feel like you can't play along unless you have small kids for photos or don't follow these formats, we want everyone to come play along. I know we have people who have done a Disney at Christmas album using all photos of the parks during the holidays. I don't have kid photos and I do one every year. So who is playing along this year? Do you need to finish last year's album? I sure do!!! Do you put the album together before December and then just add the photos? ***Feel free to share links to your progress or finished pages or share them here in this thread, but only Disney projects and albums in our gallery please. 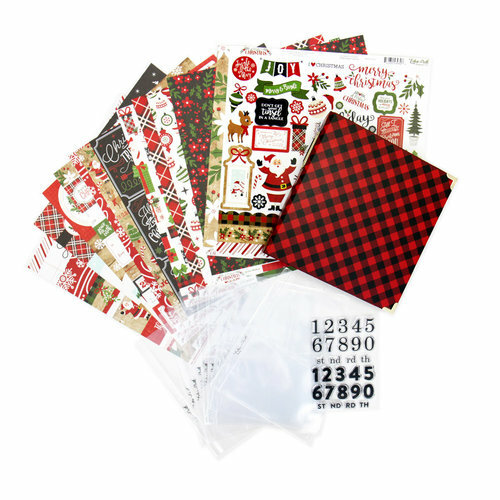 I just noticed that Scrapbook.com is starting to add some full kits so I thought I would share a few links to inspire you to create your own or just pick one of these up. The coordinating albums are very nice this year. I will warn you that these kits seem to go fast every year. I got NOWHERE last year. Like literally I think I did 4 pages. I was considering just doing this year with the same kit and skipping last year but I have decided I do want to finish last years album so I hope to get a start on that at the beginning of November. I will probably end up doing this years in January since that is what I normally do. I also need to look into doing something for 2013. Due to life circumstances I just didn't have the heart to do the album and I threw the project away after the first week. But now I have a void and it bothers me so I am thinking of just doing the highlights, not every day. that is a great idea Janeen. I have done that. I really think you should get it done though. Every year I make albums for Christmas but never really a December Daily. These kits are beautiful, the Echo Park one is awesome ! This will be my fourth year with December Daily, I ordered a new album, main kit and extras from Ali Edwards - luckily my birthday falls just before DD launch so I always use my birthday money to fund my need for DD supplies. I have loads left from previous years. Around October, I will get out last year’s album and finish off the last few pages - photos and journaling is ready, I just need to pull it together. I don't think I will be doing one for this year as this year is not going to be a good one in our house...but since I never finished last year I want to get that one done. I have done one for several years now - I think I started with 2012? I can't remember! I love the vast majority of releases this year, but I have a ton of things that I need to use up, so I grabbed a few little things from Elle's Studio and a stamp set from Ali Edwards, so that will be it for me this year. I got the Simple Stories Merry album with the woodgrain from the LSS and will use that, as it works so well for our first Colorado Christmas! My usual before-hand prep involves organizing things into an IKEA desktop organizer, so that things are grouped accordingly. If there are things that I know will be for certain days (we always watch The Grinch movies on Dec 2 in honour of my Mom's birthday and her memory; or the 25th), I will put them in specific baggies to ensure things are together. I tend to do it weekly, so that I can send in a batch of photos at a time - sometimes I do the journalling and such within the album, then just add the photos later. I've really simplified things in recent years, and don't feel the need to add every single photo from a day, or will combine photos from several days for a theme on a particular day (like all the Santa's that I have or all the movies we watched throughout the month). I really like this approach, especially when things are rather busy. this is my kit from last year that I NEED to do first!!! I moved the red album to 2018 and I am using a gold album instead. this is all I have done from last year so I have a LONG way to go. For those who don't know, I always start with the day after thanksgiving because that is the day we start decorating. Last year it was REALLY early so there is alot of November. And on this page I didnt even put one photo because we did the yard but the photo wasn't great so I planned to add a photo later and I don't even know if I ever did get a good photo of the yard. LOL! And the worst part is that when I pulled this out to see how much I had done, I realized that we had planned on buying a new big tree for the front livingroom this year after having so many problems with our old one last year. I need to get serious about finding one soon before all the good trees are gone. I don't suppose I can talk DH into having a second white tree and no green tree. LOL! I don't want to put together my 2018 kit til I finish this one. Hi all! Time for December Daily again, yikes! I did finally finish my 2014 album, so go me?! My approach to this has changed over the years... in 2014 and 2015, I had a full 6x8 album with something for each day. It took me 4 years to finish 2014 and I'm nowhere near done with 2015, so I'd say that wasn't the best approach. For 2016, i still did the 6x8 but without sticking to the structure of one thing for each day. I just added the things I wanted to add and didn't have numbered days. Some of it might be a little out of order, but no biggie. The problem with 2016 is that is also the year I started doing pocket pages in my regular scrapbooks. So then it turned into an internal arguement - what goes into the regular book vs. the DD?? So in 2017, I ditched the separate album and just did the DD in my regular album - a mix of pocket pages and full size. That's working great - still not done but it's much better for me. So this year, I'm doing the same as 2018. Trying not to buy much in the way of new stuff. I have some Crate Paper Falala from last year, and I'm mixing a little Elle's Studio that matches. 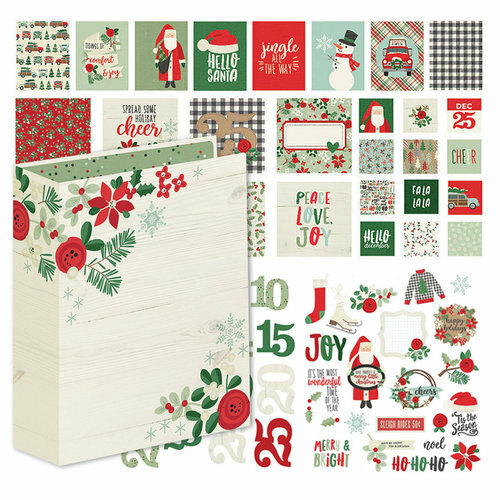 I might pick up a little of the Merry Days collection to mix in too (like those thickers!). We will see how it goes!